Never lubricate the water pump seal surface with oil or grease. Install the water pump seal with the special tools. 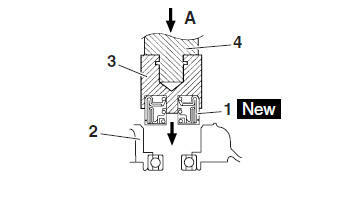 Install the water pump seal with the special tools to the specified depth as shown in the illustration. Water pump housing gasket "1"
Water pump housing plate "2"
Before installing the impeller shaft retainer, lubricate the slit on the impeller shaft end with a thin coat of lithium-soap-based grease. 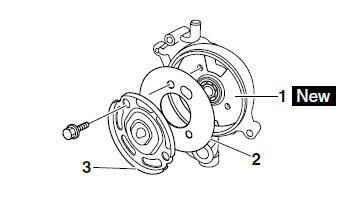 Install the water pump housing gasket, water pump housing plate, and impeller shaft retainer as shown in the illustration. After installation, check that the impeller shaft rotates smoothly.